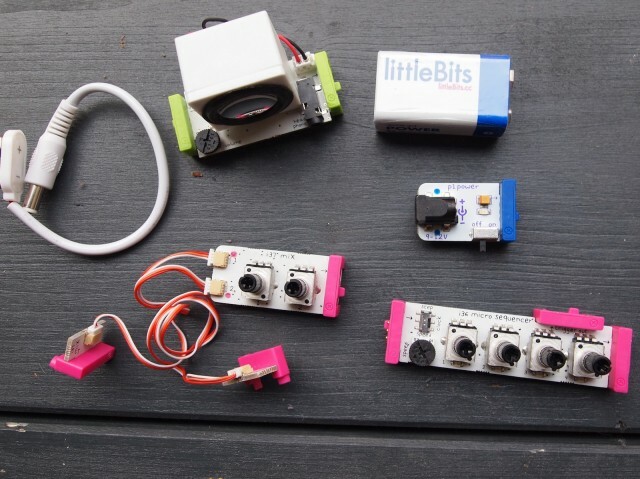 New York startup littleBits and founder Ayah Bdeir helped pioneer the modern definition of open source hardware. But they also put it into action, getting even young kids snapping together their own hardware ideas. 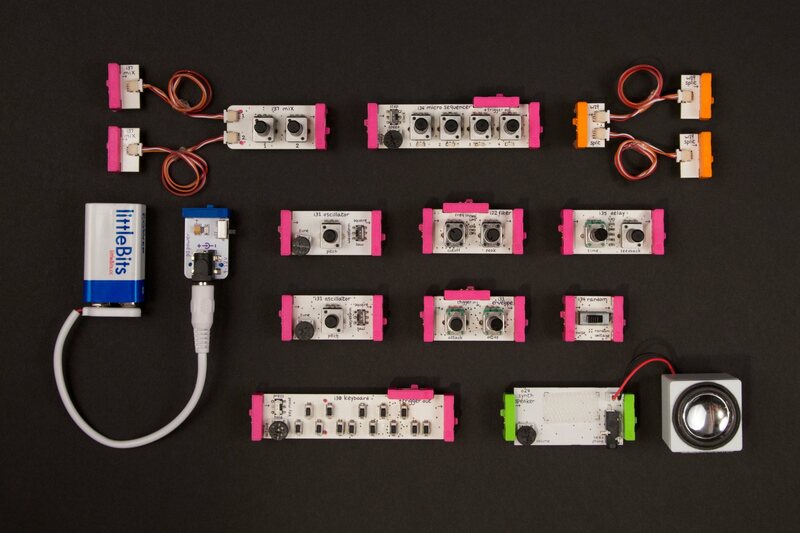 The process is addictively simple: whereas platforms like Arduino require breadboards and wires, littleBits’ tiny circuits are already pre-made and snap together with magnets. It’s an idea that screams out for sound applications. And now – in a collaboration that leaked earlier this week – that’s happened. The surprise is, the collaborator is none other than KORG. The price: US$159 (direct, and at some retailers). 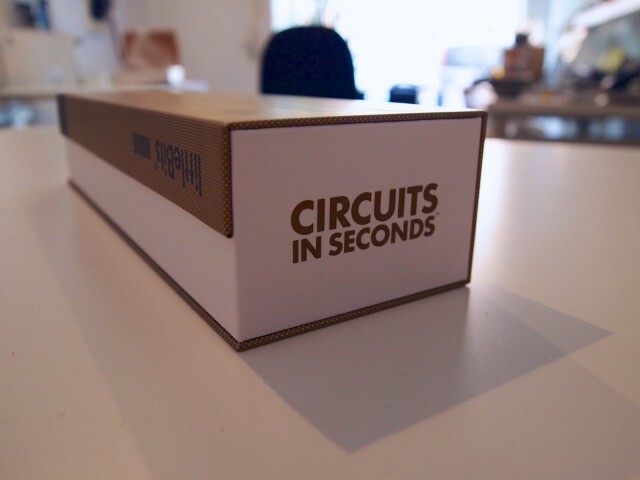 That buys you a box full of miniature circuit boards containing the basic elements of a synthesizer: a keyboard, a sequencer, oscillators and filter and envelope, and even a delay. (We have full details of the modules below.) The oscillators and filter and delay were derived from the KORG monotron, meaning the filter circuit is the latest adaptation of the MS-20’s filter design. (This one uses the second-generation MS-20 filter, not the original filter as found on the monotron, though the character isn’t entirely different.) 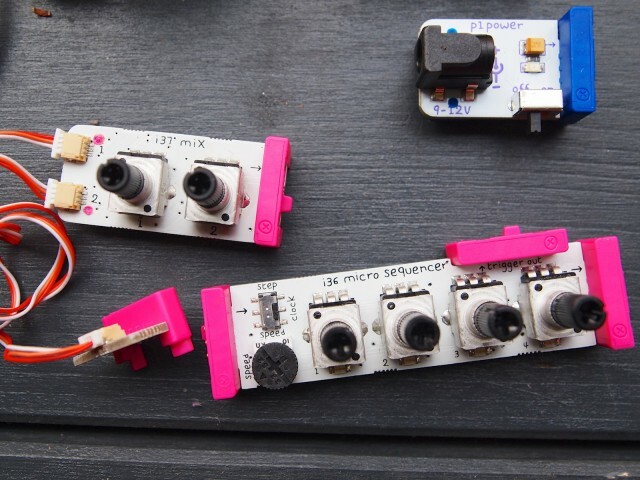 They’ve undergone some modifications to make them work in the littleBits set, but they still retain their distinctive sound. And that means what you get is perhaps best described as a build-your-own monotron prototype. 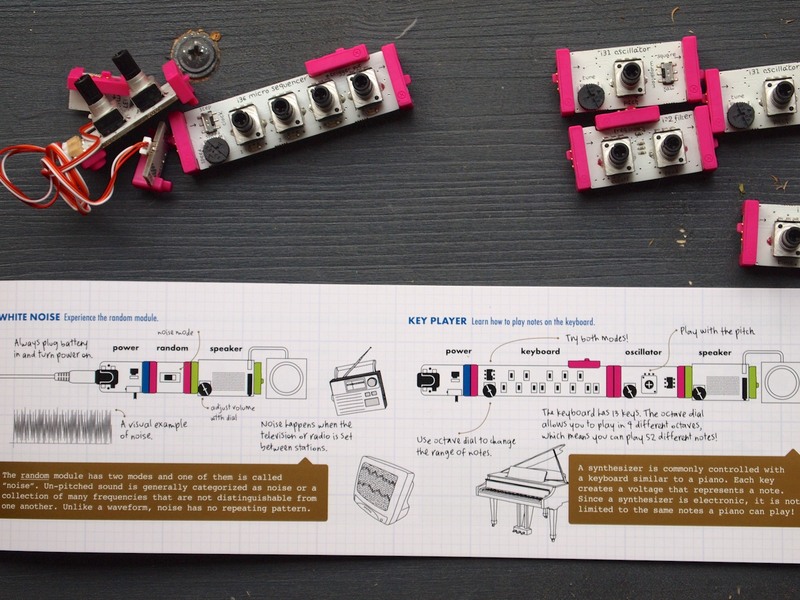 Where this gets interesting is that you can mix and match the synth kit with other littleBits projects, adding motors or blinking lights or sensors. It’s definitely pricier and more limited than using something like Arduino, but you don’t have to muck about with breadboards, wires, code, and soldering irons. Almost everything just works. And it could easily be a gateway – or rapid prototyping solution – to those other systems, especially for kids (or anyone in a hurry). The best way to see what this means is to watch Reggie Watts’ cute demo video. It happens fast, but take particular note of the moment when he adds motor-driven animated figures – something you can’t easily do with a conventional sound modular. 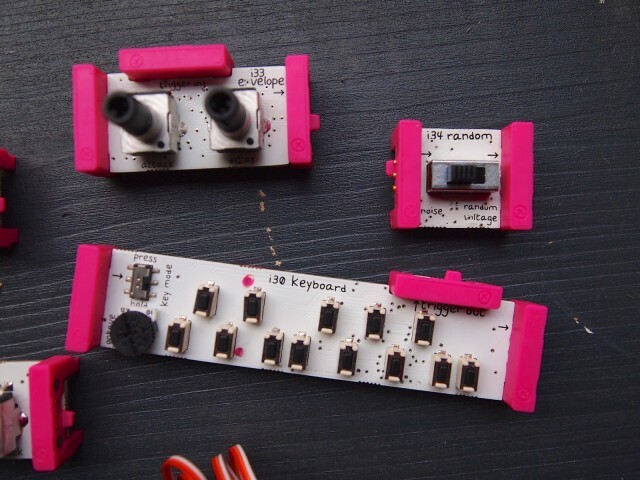 littleBits Synth Kit from littleBits on Vimeo. I’ve also had a hands-on demo with Paul (who made some fascinating little combinations) and just received a pre-production set; we’ll have some sounds for you next week. Keyboard: 13 switches give you an octave of notes; there’s a dial for register. “Press” mode is momentary; “hold” sustains the pitch. You actually get two outputs: the pitch output, but also a trigger output for controlling other modules. Micro sequencer:Step through four sequence values, each set by a knob. You can clock the sequencer either using the knob or externally (in step mode). That means you can trigger steps (via the keyboard, for instance), or send a pulse for external clock. Envelope: Attack and Decay knobs, for a simple two-stage envelope. Filter: Cutoff, Peak (Resonance); with Peak all the way up, the filter will self-oscillate (which means you have a third oscillator, if you like). Mix: Two inputs, one output. You also can use the Mix module two combine the two oscillators. Split: (2x) One signal input, two signal outputs. 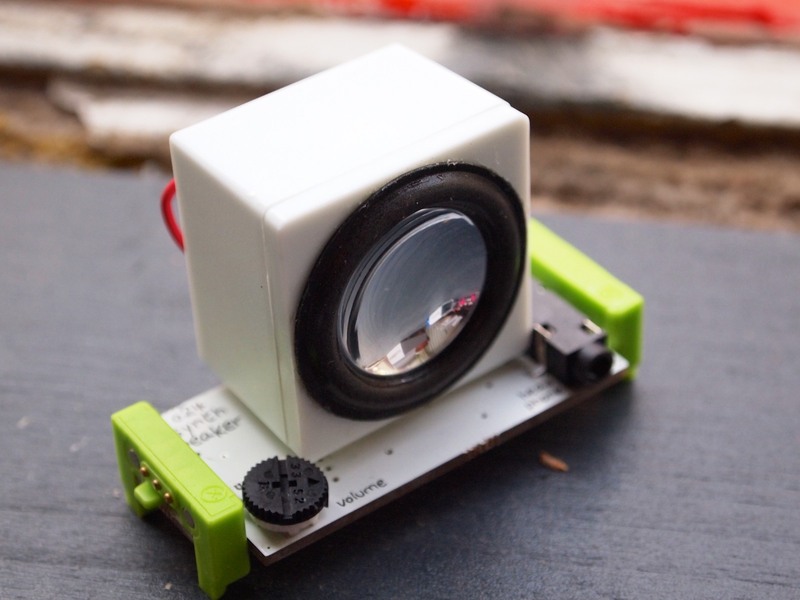 Synth Speaker: This module has a small speaker atop it, plus a volume control, but it also has a 3.5mm minijack output for headphones or line output. These modules come with a booklet that explains their function, plus all the basics of sound synthesis. It also has some fun projects, with warnings to get adults’ help. (Okay… uh… I still imagine all of us grown-ups raiding the paper plates and causing mayhem with the hot glue gun.) This includes novel routings for making practical synths, and physical modifications – like building a keytar, or attaching straws and plates to the knobs to make a DJ-style platter interface. Can you perform with these? Absolutely. “Tats” joined Reggie Watts and chip musician Nullsleep onstage at Le Poisson Rouge in Manhattan this week. He told me that he already had the synth kit ready to go, and soldered a single wire from the underside of one of the modules to a volca for clock, for an impromptu volca + littleBits concert. What about MIDI? 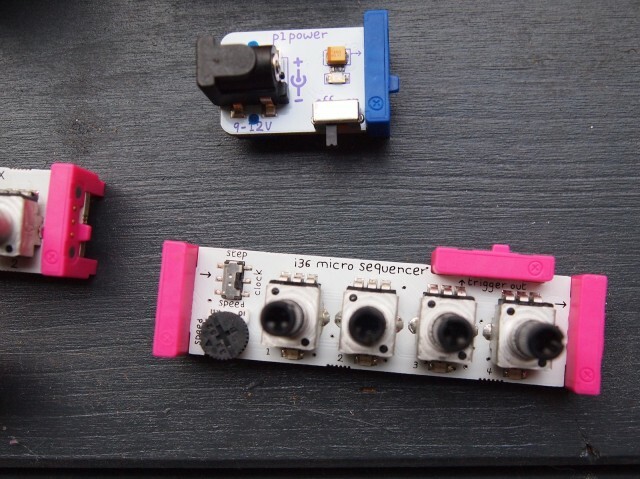 There’s no MIDI yet, though Paul tells CDM that littleBits would like to release such a module in future. But it wouldn’t be hard to hack other connections, analog CV or MIDI. How close are these to the monotron circuits? 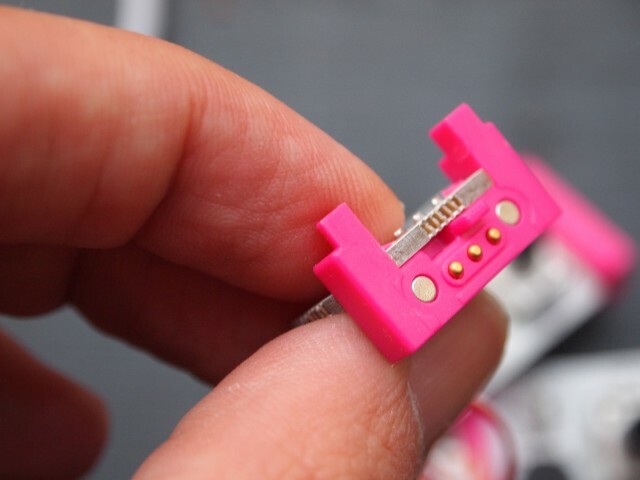 Tatsuya says there was a bit of work to adapt the circuitry to littleBits, first and foremost the non-trivial issue of making everything run at 5V. But they are otherwise quite close. I asked (and even Tatsuya asked) if this was a significant issue for KORG. 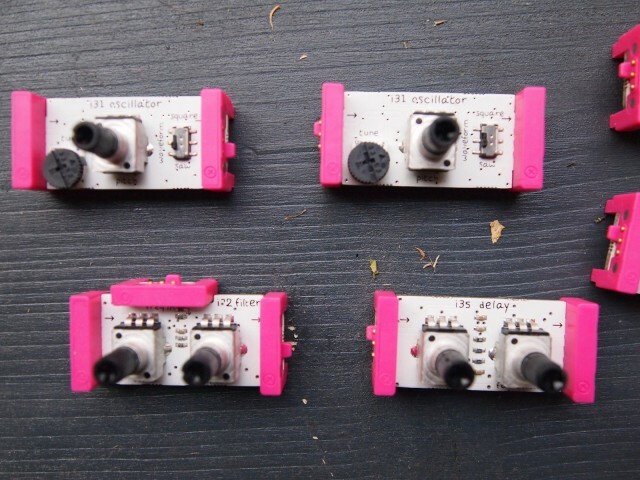 Tadahiko said there wasn’t even much discussion; the company was pleased with the enthusiasm from customers over releasing circuits like those for the monotron. Adding the explicit license almost sounds like a (generous) afterthought. What if you want to make your own modules? This isn’t really possible yet – though attaching a wire as Tats did is easy enough. But Paul says that a Hardware Developer Kit is in the works which would allow people to create their own modules. It seems that the music and sound community will be all over that, even more so than the existing people using littleBits. Why does KORG keep doing this cool stuff? I talked to Tadahiko a bit about where the motivation to do this at KORG originates. He spoke really passionately about the desire to do “interesting” things – that all the way to the top, chief Kato Seiki makes doing interesting things, things that make customers happy, comes first, even before business considerations. And having a company that investigates ideas first and then thinks about the business case to me is fascinating. What modules might you add on? There are “exploration” kits full of lots of options, but Paul when he was in Berlin demonstrated four that are also displayed on the included booklet, and they make a lot of sense. There’s a microphone, which also lets you input signal – perfect for using the filter. There’s a pressure sensor. There’s also a bar graph (which displays levels anywhere in the signal chain, though it’s more useful in some spots than others). Or you can go crazy with ideas like (EL) light wire. 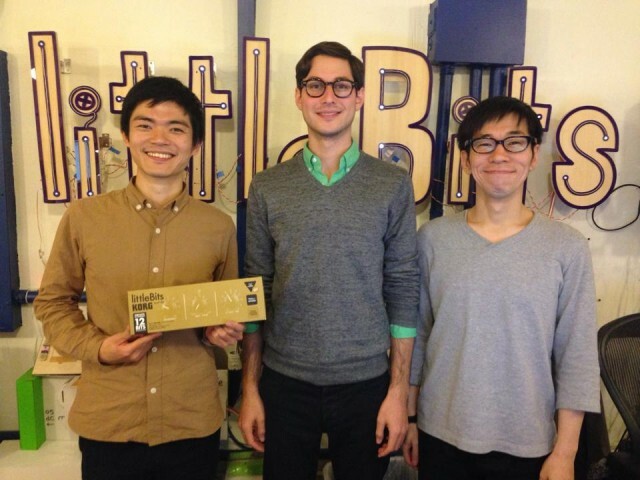 Dream team: littleBits’ Paul Rothman (Product Development), flanked by KORG Chief Engineer Tatsuya Takahashi (left) and KORG Product Originator Tadahiko Sakamaki (right). Photo courtesy Tatsuya. I’m really excited to see what people do with the littleBits series, partly because there’s now a resurgence in interest in DIY and modular. This isn’t necessarily the best or most practical synth you can buy for $159, absent MIDI and some other options (and without a case). But if you are willing to spend a bit of extra money on the convenience of the magnets, and want to piece together your own, very tiny modular, it’s a crazy amount of fun. And Tatsuya said something interesting about the motivation behind these. I asked, clumsily, if there was some sort of renewed interest in DIY sound instruments. Tatsuya went further, and said he thought people were interested in exploring sound. Understanding that as the main motivation behind all we do, behind our desire for these tools, I think can’t be overstated. With that, I hope you get some music making time this weekend. Enjoy, and see you next week. 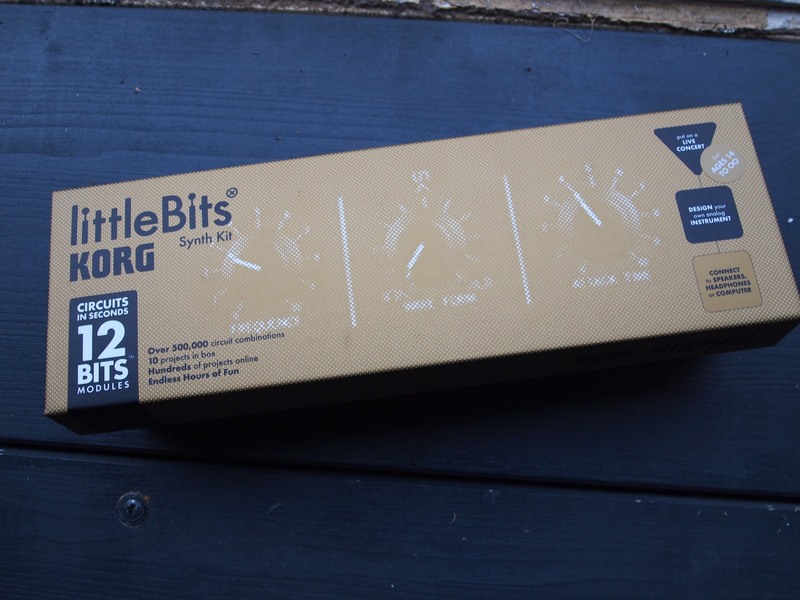 If you’ve got more questions about the littleBits, let us know so we can include them in our review.